Natalia Kills snapped a picture from behind the scenes of a photoshoot wearing a shiny black Topshop Palma Patent Dress ($110.00). 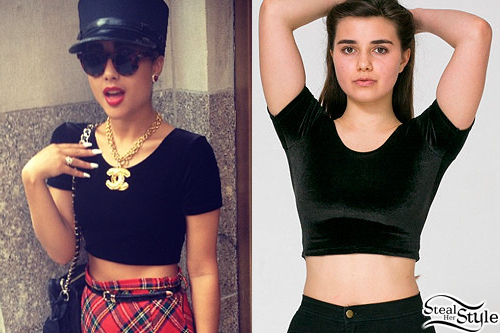 Natalia Kills posted a new instagram photo a couple of days ago wearing a American Apparel Velvet Crop Tee ($36.00). 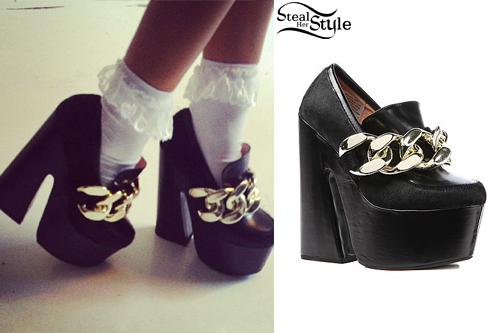 Natalia Kills posted a new instagram photo wearing a pair of Jeffrey Campbell The Hudson Shoes ($185.00). Natalia Kills wears a Cotton Spandex Sleeveless Crop Top in Kesh Eye Print ($35.00) from the KESH X American Apparel collaboration collection. 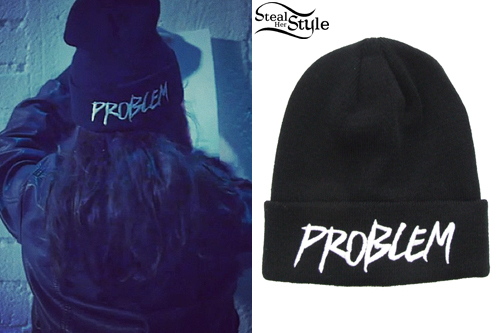 Natalia Kills posted a photo on instagram a few days ago wearing a Black Problem Beanie ($20.00) from Looking for Trouble. Natalia Kills posted a photo of her Kurt Geiger Games Platform Wedges (£180.00) onto instagram a couple of weeks ago. Natalia Kills wears an American Apparel White Tennis Skirt ($54.00) with a top similar to the Lacoste Technical Pique Mixed Mesh Tank Top ($75.00). She accessorizes with a vintage Chanel Logo Necklace ($1,600), but you can steal the look with an ASOS Extra Long Chain Necklace ($24.94) and Michael Kors Drop Chain Belt ($48.00). 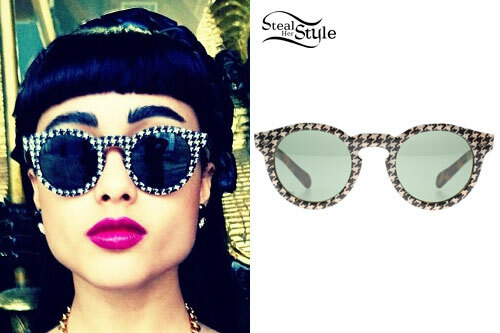 Natalia Kills wears the Houndstooth Printed Sunglasses from Ralph Lauren ($250.00), but you can get the look for less with Retro Houndstooth Wayfarers from Sunglass Warehouse ($11.96). 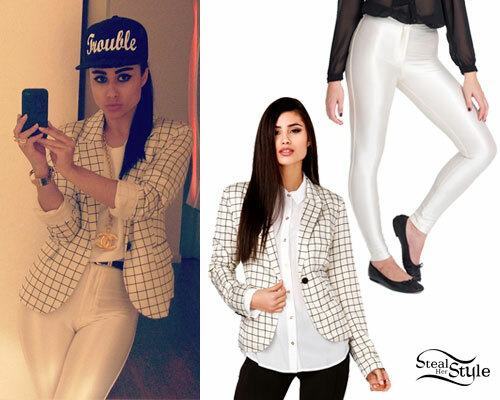 Natalia Kills wears an icy white outfit with a Forever 21 Grid Pattern Satin Blazer in Cream/Black ($34.80) and American Apparel Disco Pants in Pearl ($85.00). 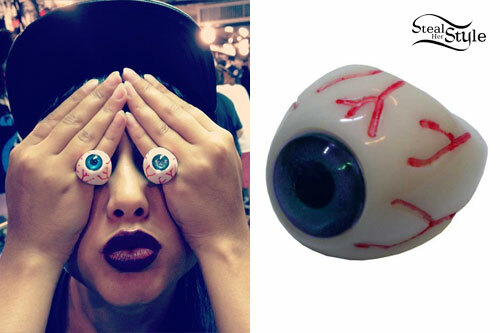 Natalia Kills covered her eyes with two Blue Eyeball Rings from Kreepsville 666 at $7.50 each. You can also get similar plastic eyeball rings at many party stores for only $2.99 per dozen, though naturally these ones look cheaper. This entry was posted in Fashion+Style+Beauty and tagged Jeffrey Campbell, Jon Hamm, Kurt Geiger, Michael Kors, Natalia, Natalia Kills, Shopping, United States. Bookmark the permalink.